Today I'd like to discuss with you something that goes beyond drums recording strictly speaking. Actually, what we'll see has probably more to do with the mixdown stage, but I think it's nevertheless useful to discuss it here, too: panorama. 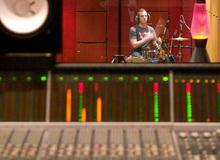 In other words: should you think about the drums from the listener's or the drummer's perspective? The first time I ever asked myself this question was at the beginning of the century. I had decided to dedicate my life to music and, back then, my university studies were still pretty fresh. What does that have to with anything, you ask? Well it just so happens that I was supposed to become a math teacher. So, after doing lots of research on the topic and analyzing tons of mixes, I couldn't get a straight answer regarding the panorama of a drum kit, which led me to put to use my statistics knowledge to carry out a study. I would've never imagined that 15 years later it would help me write an article for Audiofanzine... I guess it was destiny. Here are the results of the survey I did and the conditions under which it was made. Did you notice any changes between the different versions? If you did, what changed? Did you prefer any of the versions? If you did, which one did you like better and why? Under which conditions did you hear the songs? How would you consider your musical consumption? If possible, indicate the approximate frequency and amount of consumption. Do you play an instrument? If you do, which one and at what level (pro, semi-pro, amateur, other)? Do you have any practical or technical knowledge of sound (as a professional or semi-professional audio engineer, studies in physics, etc.). If you do, please specify at what level. At the end of the questionnaire was a rather "original" section dedicated to personal information such as age, gender, place of birth, profession, level of studies, height, eye color, length of hair, etc. The idea was to create some confusion in order to get to what I really wanted to get: discover whether the listener was right or left-handed. I somehow sensed that this laterality issue could be important, but I did not want to condition the respondents asking them only this information. Now let's look at the results. I'll begin with the drummers. Every one of them identified the versions correctly. 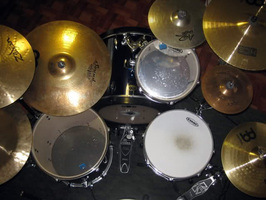 80% among them preferred what is commonly called the "point of view of the drummer" but… only one of them was a lefty! On the other hand, among the 20% that preferred the "point of view of the audience" only one was right-handed. And since the rest were lefties, the famous "point of view of the audience" was actually the "point of view of the drummer." In short, 90% of them went for the point of view of the musician. Interesting, isn't it? Now, let's see what the musicians thought: 96% identified correctly each version, 4% got at least one of them wrong so their eventual preference was considered invalid. 33% preferred the point of view of the audience, 60% that of a right-handed drummer, 3% didn't indicate any preference. If you remove the drummers from this group, 36.25% preferred the audience's point of view and 55% the drummer's, 3.75% didn't care. Laterality had no significant influence among the group of musicians, excluding drummers. However, the instrument played seemed to have an important role, since 3/4 of the people who preferred the point of view of the drummer played either guitar or bass. Now let's look at the results of those who have no direct relationship to the music world: 90% of them identified each of the versions correctly. As before, the remaining 10% got at least one of them wrong so their eventual preference was considered invalid. 37% expressed their preference for the point of view of the audience, and only 19% for that of the drummer. 34% didn't prefer any of them. Once again laterality didn't seem to have any significant influence on this sample. But I discovered a somewhat odd detail: 85% of the people who preferred the point of view of the audience listened to the songs in their cars. I'll leave you to analyze the results until next time, when I'll tell you my own personal conclusion.